The chemistry that creates pain signals in your body is increased by starchy and sugary foods. Itâs can be decreased by protein foods. Controlling inflammation and therefore pain is done best by avoiding carbohydrates you donât need. This means sweets and many of the grain products. 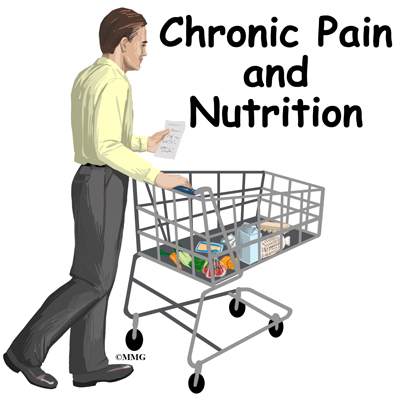 Meals that regularly include lean meat, fish, and eggs are essential for controlling pain chemistry. Portion control is also central in controlling inflammation, and to successful weight loss. Portion control means not eating more food than you are using for fuel on a daily basis. Research suggests that losing as little as seven to 10 per cent of your current body weight can help. Such a weight loss can change your body chemistry for the better. These changes can help decrease physical pain. Diet and exercise are crucial. Medication, herbs, and nutritional supplements can help but wonât be enough without your efforts to improve your muscle tone and lose extra fat. There is a lot of mistaken information about how to lose weight. Ninety per cent of people regain fat once lost. Preventing re-gain is crucial to long-term health. Recent interest in the epidemic of obesity has resulted in new information about how you can successfully lose weight and keep it off long-term. Itâs important that you lose fat in a healthy way. The goal is to keep it off the rest of your life. The usual dose is about 150 mg three times daily. The product should contain 37.5â65 per cent boswellic acids. Ginger appears to have a protective benefit against stomach ulceration. This is different from over-the-counter or prescribed NSAIDs. Ginger doesnât cause any major side effects. It has mild effects that may interfere with blood thinners and drugs used to treat gallstones. Devilâs Claw (Harpagophytum procumbens) has a long history of use in the treatment of musculoskeletal complaints. Recent research has shown that it is useful for relief of mild to moderate pain. Twelve clinical trials found Devilâs claw to be both safe and effective. It has no more adverse effects than a placebo (sugar pill). These studies showed that people had at least as much pain relief from the plant medicine as they got from commonly used non-steroidal anti-inflammatory drugs (NSAIDs). And they had fewer uncomfortable side effects than with the NSAID. Less than 10 per cent of users reported mild diarrhea or GI upset. Even fewer had some dizziness. Devilâs claw may increase the blood thinning activity of drugs taken for anti-coagulant therapy. Devilâs Claw usually costs less than NSAIDs. The most useful products will have standard amounts of harpagosides. The effective dose for most people is between 30 mg and 60 mg of harpagoside daily. Treatment should continue for at least four weeks. Many people will still improve eight or more weeks after starting treatment. Studies have shown that bromelain can be as effective and a safe alternative to NSAIDs in the treatment of painful episodes of osteoarthritis of the knee. Results of these studies showed that people with sinusitis who took bromelain had better breathing and decreased mucosal inflammation. People using up to 8,000 mg of curcumin per day for 3 months found no toxicity from it. Five other research studies showed people could use 1,125-2,500 mg of curcumin per day without problems. Turmeric is not advised if you have certain health problems. These include bile duct blockage, a blood-clotting disorder, a history of stomach ulcers, or gallbladder disease. Turmeric may increase the risk of bleeding or increase the effects of blood thinning drugs. It has been used for hundreds of years in East Indian and Asian cooking. Even so, there isnât enough research yet to say whether turmeric or curcumin is safe to use by pregnant women or nursing mothers. Quercetin is one of the most important plant medicines we have studied. It slows down the production of histamine and other inflammatory chemicals from white blood cells. It reduces acute inflammation and the swelling and pain of arthritis. There are currently no reported adverse reactions to quercetin. There is not yet enough safety data available to recommend the use of quercetin during pregnancy or while nursing a child. Vitamin D (cholecalciferol): New research shows a big increase in the number of people in the United States who donât have enough Vitamin D. Low levels of Vitamin D are especially likely in people with chronic musculoskeletal pain, limb pain, and low-back pain. People with too little vitamin D can take an oral (by mouth) pill to supplement their vitamin D. This can have anti-inflammatory benefits. Treatment with vitamin D can safely lead to a big decrease in musculoskeletal pain for many people. It is best to have a yearly blood test to measure your vitamin D levels. Then it can be adjusted as needed with supplements. People taking moderate doses of vitamin D (adult range 4,000 â 10,000 IU per day), should have blood levels of calcium measured every six or so months. Too much blood calcium is the best indicator of vitamin D excess. High doses of vitamin D (up to 100,000 IU per day) have been safely used during pregnancy. Testing of calcium levels in the blood is needed to check for high blood calcium. High doses of vitamin D should not be taken by people who are also taking thiazide diuretics. Likewise anyone who has a vitamin D hypersensitivity syndrome should avoid too much vitamin D. This includes people with primary hyperparathyroidism, adrenal insufficiency, hyperthyroidism, hypothyroidism, or granulomatous disease. Granulomatous diseases include sarcoidosis, Crohnâs disease, or tuberculosis. The idea of taking a pill to solve our problems usually sounds good. This seems true no matter how many times we try them and they fail or even cause us harm. Many specific nutrients are very valuable, for many reasons, before, during, and after a weight loss effort. But thereâs no pill that can cause weight loss if you do not also change how you eat and exercise. The dairy industry has turned these observations into an advertising campaign for milk. Milk products are difficult for many people to digest. They add calories and fat to your diet. We know humans donât actually need dairy products to get enough calcium. We were around for a long time before animals were tamed in order to get at their milk. You probably arenât making soup and chewing on the bones of the animals you eat. This is what our ancestors did to get calcium. Today, eating lots of dark leafy greens (like broccoli, which is very high in calcium) and taking a supplement is your best bet for having all the calcium you need. Adult men and women, 50 years of age and younger, should take in about 1,000 mg - 1,200 mg/day of calcium. Older men and postmenopausal women should get 1,200 mg â 1,500 mg/day of calcium. Taking a supplement containing at least 10 mcg (400) IU/day of vitamin D will help to make sure your calcium is absorbed in your gut. This amino acid is a safe and effective support for increasing serotonin. Serotonin is a key brain chemical that helps you feel calm and satisfied. It can help you lose fat by reducing carbohydrate cravings. It helps stop eating binges and therefore reduces calorie intake. It can trigger a feeling of fullness so you have a greater sense of satisfaction from your meals. This product will not help you lose weight if you donât choose the proper amount of healthy foods and if you donât exercise regularly. The recommended dose is 100 mg three times daily. Take it 20 minutes before meals for at least four weeks. A condition known as Serotonin Syndrome can result if your body produces excessively high levels of serotonin. This syndrome can also occur if your body canât break down serotonin fast enough. Symptoms include confusion, fever, shivering, sweating, diarrhea, and muscle spasms. This syndrome does not occur when 5-HPT is taken alone. There have been some reports of this syndrome when a related amino acid called L-tryptophan was used with prescription drugs that inhibit serotonin activity. These drugs are called monoamine oxidase (MAOs). MAOs break down molecules of serotonin. You should stop taking an MAO-inhibitor for at least four weeks before beginning therapy with 5-HTP or any other serotonin-active substance. Also, you should not take 5-HTP at the same time as any prescription anti-depressant. For example, donât take 5-HTP if you are taking Prozac, Zoloft, or Paxil unless supervised by a physician. Do not stop or adjust the doses of any prescription medication without first talking with your physician. Possible side effects include a mild nausea that doesnât last. This is more likely to occur at higher doses, in the range of 200 mg to 300 mg. Treatment of depression and insomnia require smaller doses, so this isnât usually a problem. Even if nausea develops, it disappears for most people in two to 14 days. Consider using ginger tea or capsules to decrease the nausea. There are no known safety problems with L-theanine taken in doses up to 600 mg every 6 hours. In Asian countries women have been drinking the teas that theanine is extracted from for hundreds of years with no problems. However, there is no research on L-theanine in capsule form. So we canât state it is safe for use by pregnant women and nursing mothers. Green tea has at least two different chemicals that work together to increase the amount of calories you burn in a day. One study showed that people taking green tea extract containing at least 90 mg epigallocatechin-3gallate (EGCG) burned 266 more calories per day than those who didnât take the green tea extract. The supplement was taken three times daily. Other chemicals in green tea have also been shown to reduce how much fat is digested from a personâs meals.